There are so many cool things happening in the gardening world. People are experimenting with fun new techniques- all with the aim of better food, greater access to that food, and smarter designs that limit the demand for land and labor. These are designs that free us up to do more with less. Here at the farm we are hopping on that train. Our garden currently occupies about a half an acre. Right now it is designed to feed the clients at our main residential facility (about 25-35 people) with fresh veggies throughout the growing season, and a little leftover to store. Eventually it would be wonderful to expand the garden’s service to feed more of our clients and the public. What if we could gradually achieve this without the need for more space and energy, but rather through the implementation of a smarter design? These are some of the concepts we’re playing around with here at the farm. Introducing the “Strawberry Barrel”. We saw examples like this on the internet, mostly for people in urban spaces with limited access to land. Why not try it on a farm? It was a simple and cheap project, and will be useful for years to come. 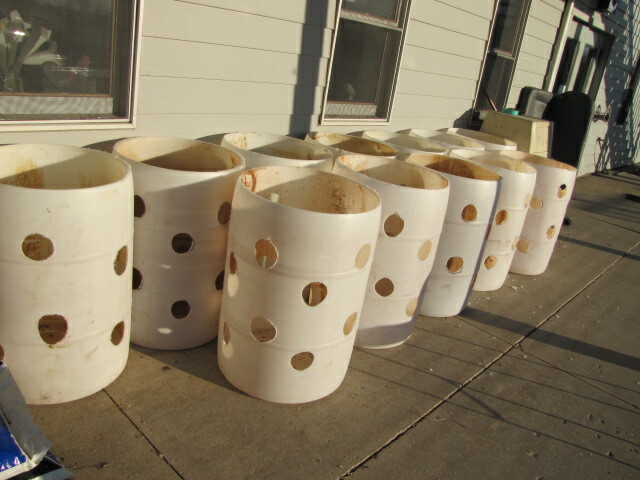 We found some cheap food grade 55 gallon barrels on craigslist. 12 of them, all together. 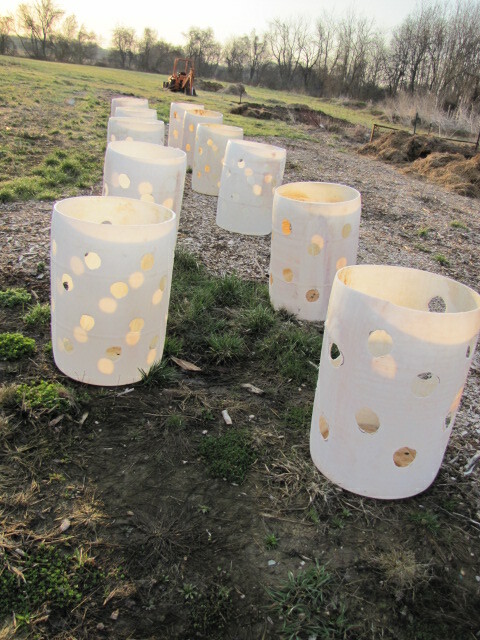 We removed the tops and put holes in the sides all around, about 20 holes per barrel, give or take a few. 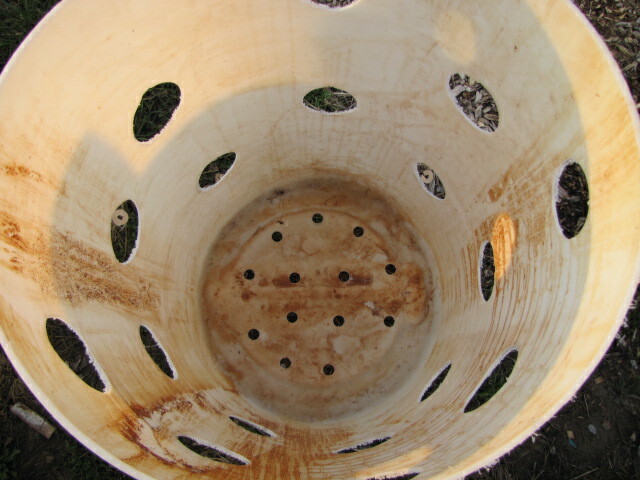 We also drilled some holes in the bottom for drainage. These barrels were once filled with apple cider vinegar! Then they were set out in the garden and filled with soil. 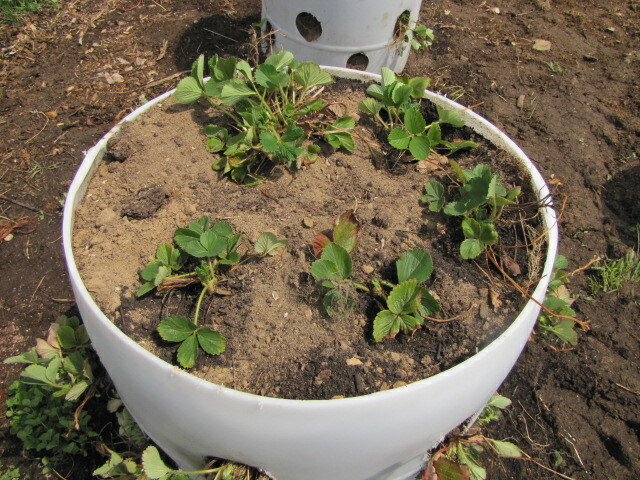 Here is one, all planted up with strawberries. We transplanted them from another area of the garden. 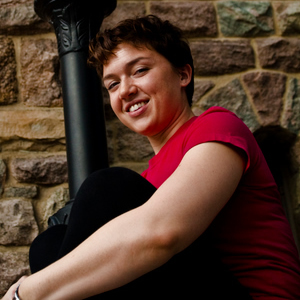 In that area, they occupied approximately 1,875 square feet. In general, strawberries are planted about 12″ apart. This vertical method means we fit about 25-30 plants in 4 square feet. Quite a savings! They did go through some transplant shock, but are bouncing back well after a couple of rains. This means we have the entire area where they used to live that can now be used for other annual vegetables. We’ll be sure to keep you updated on how this experiment is going. 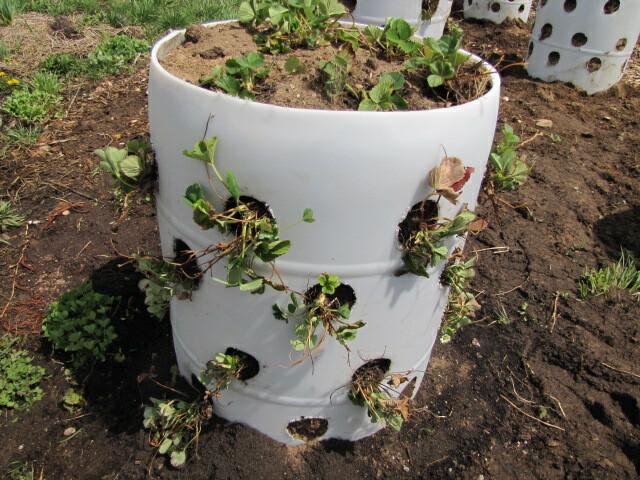 We had some extra strawberry plants that we’re transplanting into some perennial gardens and around the main house, so we’ll be able to examine them in different areas/conditions in order learn more.